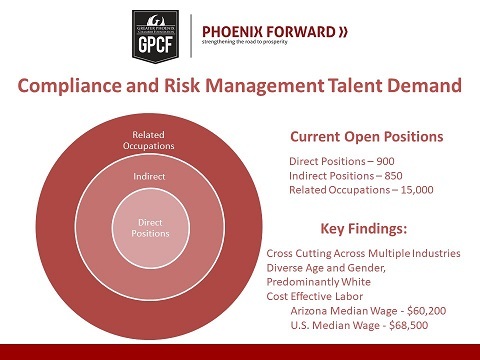 Arizona’s growing economy combined with the constant flow of new and updated regulations has set the stage for exponential growth and opportunities in the compliance and risk management profession. In the Greater Phoenix region, there are thousands of open positions right now, ready to be filled by innovative, analytical problem solvers who want to play a vital role in ensuring their organization’s success. Just graduated? Searching for a career? Want to be vital to an organization? Ready to make great money? Click below to learn why a career in compliance or risk management is right for you. Referred to by many as the fastest-growing corporate career in America, companies are looking to hire for these careers now. Compliance and Risk Management professionals are in high demand. While there are currently hundreds of direct positions in these careers, compliance and risk management skills cut across several occupations. With an average median wage of $60,200 and endless career opportunities, why not explore a career in compliance or risk management? Click here for a quick look at the numerous opportunities available in careers in compliance or risk management. Slide data compiled in collaboration with the Arizona Office of Economic Opportunity. • If you are, that’s great. Click Careers to search thousands of openings available right now. • If you’re an employer and want to get involved, click Employers. AZComplianceRiskTalent.com is an initiative of the Greater Phoenix Chamber Foundation’s Compliance & Risk Management Workforce Collaborative.